There came, sent by God, spirits of fire. We do not have any information about Saint Theopemptos, except that, according to the Synaxarion of Constantinople, he reposed in peace. 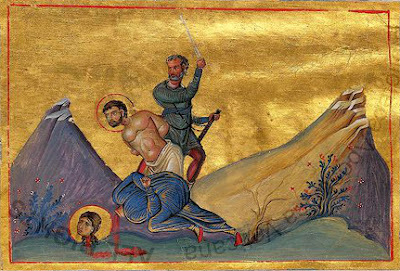 However, the Menologion of Basil II depicts him along with Saint Theodote being decapitated with a sword, offering no further information about them. Saint Theodote, however, who is separately commemorated on this day according to the Synaxarion of Constantinople, was the mother of the first pair of Holy Unmercenaries commemorated on November 1, and she is also said to have died in peace from an illness. This leads to the possibility that perhaps there was another tradition in which they both died together as martyrs by the sword, or perhaps there was some confusion and only Saint Theopemptos died by the sword and Saint Theodote was mistakenly paired with him, or they were just confused with two other Saints by the same name.